I'm trying to add a counter to a php page which generates an html table. Since the table goes down the page by default, I want to make it go side by side after %33. What am I doing wrong here? please. thanks for your help. Mirc Sam wrote: I want to make it go side by side after %33. Could you explain what you mean by after %33? Do you want to do something different when the counter is multiples of 33? And Welcome to the Ranch! What I mean here, normally table goes down the page, you need to scroll down to see the rest. What I am trying to do, after 33 rows (% 33 percent), I want the table continue side by side. So after every 33 rows, the table goes side by side, so can it can be viewed altogether without scrolling down. I hope this clarifies it, you can ask me if not. Sorry for posting Java code for a PHP question, but I haven't looked at PHP for a long time, and I didn't want to post anything which wasn't valid PHP code. Anyway, the concept is the same regardless of the programming language. 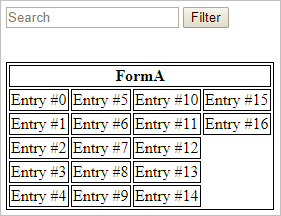 I would suggest that rather than create a number of individual tables and then figure-out how to style them to align side-by-side, it is probably better to just create a single table with the proper number of columns that would would need to hold the amount of data that you have to display. To do this, you would need to know the total number of entries which you have before starting to construct the table, and then based on the maximum number of entries you want to place in a column (in your example 33), calculate the number of column required. I use counter on other php pages, and it works. but here since I use a table in a search form, there is something I couldn't figure out to make it work. Nevertheless, I will examine your code. Thank you, Ron. I haven't used PHP also for a while. It isn't the language I like. However, your logic looks incorrect. Please correct me if I'm wrong in thinking. Why you set counter to 3 don't get, that's one. More importantly is, it seems that every iteration you set counter to 3, then increment once and during the next iteration again, set to 3 and increment... over and over again. Is that code even valid? Seems that you have only the loop in the first scope of php tags, which means counter is dangling outside as an illegal code construct. Poor indentation you have also doesn't help. Please fix that one first and re-post the code so we might see better.